Beyond its picnic areas, tennis courts and manicured gardens, High Park is a thriving ecosystem. 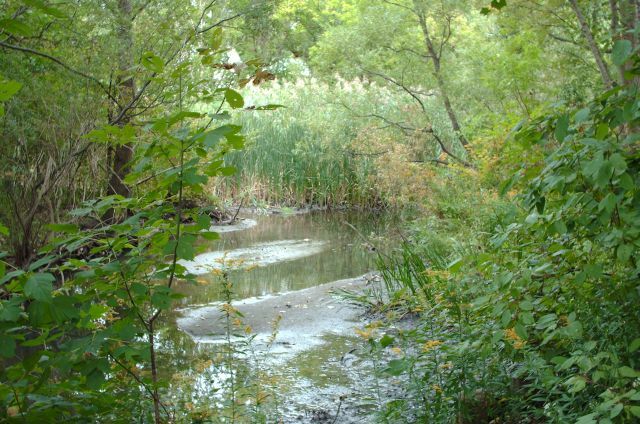 The Western Ravines and Beaches Discovery Walk explores some of the park’s wild areas, as well as some of the neighbouring regenerated wetlands. The walk starts at the Bloor Street entrance to High Park. Passing the picnic areas and a concession stand, the Discovery Walk signs lead you down into a ravine beyond the domain of cyclists (in theory) and the park’s iconic trackless train. The path through the ravine takes you to the shores of Grenadier Pond. It’s hard to believe that the marshland at the northern tip of the pond, a place of dense cattails and lily pads, is part of the same body of water lined by the short grass and benches most park visitors are familiar with. Continuing south, the walk exits the park, crosses the Queensway, passes under the Gardiner Expressway, and takes you to the shores of Lake Ontario. After lingering on the beach with the joggers and the Canada geese, take Ellis Avenue back north. You’ll see a concrete staircase leading back down into the ravine system. This is where you’ll find out if you made the right choice of shoes or not. A narrow, often muddy trail runs along the eastern shore of another area wetland, Catfish Pond. This part of the walk is especially slippery after a rain, so be careful. But don’t spend so much time looking at your feet that you miss out on the enjoyment of this quiet, spring-fed marsh. From Catfish Pond, it’s up through Rennie Park to Morningside Avenue, and back to Ellis Avenue. From the winding streets and lofty trees of this neighbourhood, it’s back into High Park towards the end of this walk. By tying Lake Ontario to the wetlands in and around High Park, the Western Ravines and Beaches Discovery Walk underscores the relationship between the city’s varying bodies of water. Also, being early fall, there is a lot of activity going on for folks who like to watch migratory birds as they prepare for their journeys. The map of the walk can be downloaded here in PDF format.